all parts of plant are edible raw. older plants can be tenderized by adding pinch of baking soda to cooking water. pods and seeds are edible, and taste peppery. seeds can be parched and ground to flour. roots can be eaten fresh or dried. burning the plant results in ash that can be used as salt substitute and/or tenderizer. 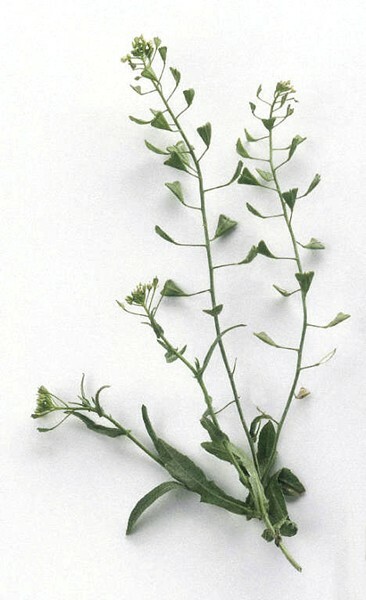 grows in a wide range as a weed, especially in disturbed or cultivated areas. warning: seeds may blister skin. I've come across this plant growing next to the sidewalks in my hometown of Edmonton. It's abundant, but not my first choice for a dinner item, since eating the raw sea pods caused tiny (painless) white blisters on my lips. Perhaps cooking the plant yields better results. The taste of the seed pods is neutral or mildly unpleasant when raw. The flower head and stem is better, but nothing to write home about.